FROM 1969 to '71, Carlos Santana and his band were the trailblazers of a new genre of music to be dubbed Latin rock. The fruits of their cross-cultural collaboration -- "Santana," "Abraxas" and "Santana III" -- still sound as thrilling and timely as they did 30-plus years ago. The eponymous debut has already received the deluxe treatment, with an additional CD containing the band's entire breakout performance at the Woodstock festival. Two years later on the Fourth of July, Santana would play the last set ever at the Fillmore West in their home base of San Francisco, and that historical recording is included with this special reissue of the band's third studio album, out in stores today. Truth be told, the music suffers at times from an uneven and muffled live mix, but it still makes for an interesting document of one of Santana's better lineups. Joining the Mexican guitarist and his core band at the time of keyboardist-singer Gregg Rolie, underrated bassist Dave Brown and the formidable percussion line of Michael Shrieve, José "Chepito" Areas and Mike Carabello were fellow percussionist-songwriter Coke Escovedo and then-teenage phenom Neal Schon on guitar. Unfortunately, following the release of "Santana III" in October 1971, this lineup would be dissolved by a musically restless Santana, with Rolie and Schon to go on to form Journey, pre-Steve Perry. But the band went out in a blaze of glory that July night in the Bay area. The band starts off its set with five songs off the then still-unreleased new album: "Batuka," the hit single "No One to Depend On" (here in three forms on the reissue, including the album and single versions), the brilliant "Toussaint L'Overture," the Rolie vehicle "Taboo" and a great cover of jazz/R&B saxophonist Gene Ammons' "Jungle Strut." They do a dutiful run-through of "Black Magic Woman/Gypsy Queen" before launching into a strong second half which starts with "Incident at Neshabur" from the "Abraxas" album. Their take on Miles Davis' "In a Silent Way" starts and ends a reverential, quiet way, with a middle section all blazing Latin rock, with Schon in particular playing a biting co-lead solo with Santana. And the closing "Gumbo" (originally recorded during the third album's sessions but never issued until this release) shows how tight this band had become. 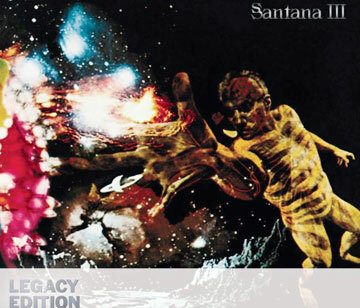 As for the studio album itself, it's always great to revisit Santana's early work. One pleasure in particular was rehearing "Guajira," one of the more straight-ahead Latin numbers, featuring such great guest musicians as fluegelhorn player Rico Reyes and pianist Mario Ochoa. And the liner notes mention that Reyes, Brown and Area wrote the tune during a tour stop in Hawaii, of all places.